We don't eat out a lot, but when we do we usually head to Olive Garden or Longhorn SteakHouse. There are one or two others, but these two are at the top of the list for favorite place to eat. I was asked recently if I would be willing to try out the new Lighter Fare Menus, and of course I obliged. I love their food but it's great knowing that when I'm counting my calories, I can enjoy a good filling dish without completely blowing the calories out of the water. 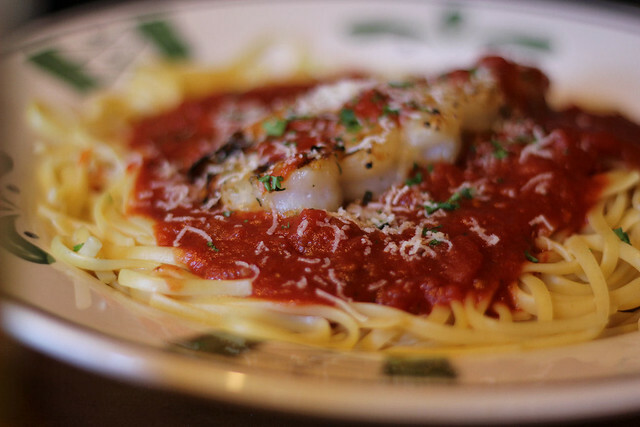 This past weekend, we headed to Olive Garden. 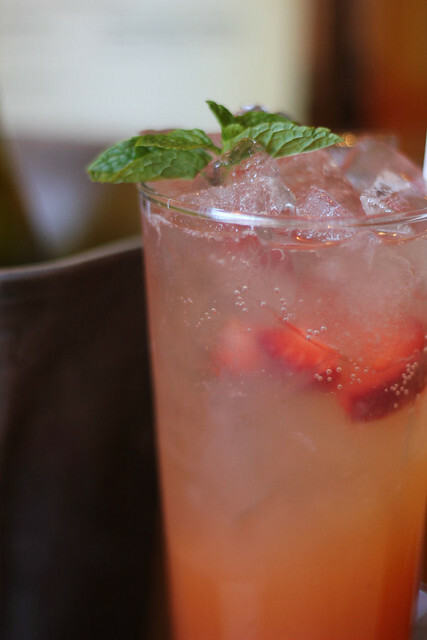 I started the meal with a delicious Strawberry Mango Limonata. YUM! So delicious. Next, the meals. I had a look through the Lighter Italian Fare Menu. I was also offered a Gluten Free menu which looked delicious too, but since I am not Gluten Free neither is anyone in my family, I decided to stick to the Lighter Italian Fare. The great thing is that the option is there, so if you ARE Gluten Free, you will be able to pick from a myriad of yummy dishes, like the Penne Rigate Pomodoro, Steak Toscano, Herb Grilled Salmon or Mixed Grill amongst others. 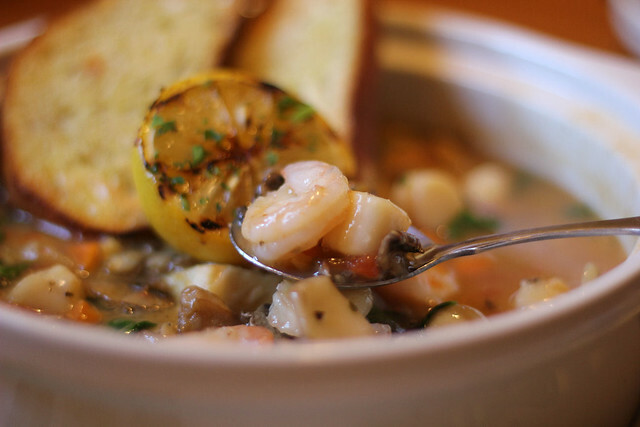 I picked the Seafood Brodetto, which is AMAZING. 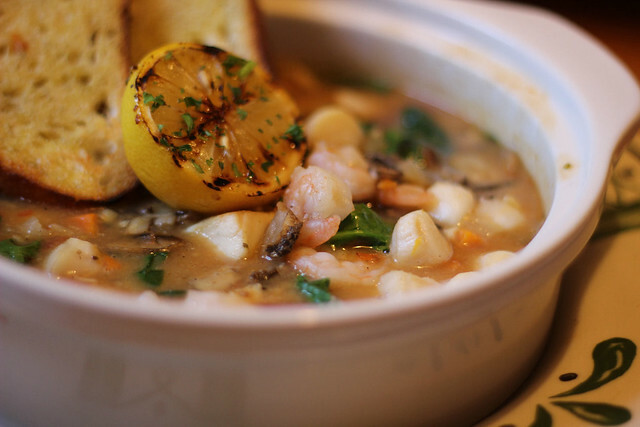 It is a soup/stew mix and the description given is, scallops, shrimp and delicate tilapia with spinach and mushrooms simmered in a light white wine and marinara-saffron broth. I am telling you, I was in heaven with this dish. It was beyond what I was imagining. Truth be told, when I think low calorie, I think bland, tasteless food, but this is not the case at all. My husband tried a few bites and said he should have ordered the same. It was THAT good. Only 480 calories. I am definitely having it again next time I'm at Olive Garden. My husband went with the Linguine alla Marinara...he added shrimp to it. Another hit. I am not a fan of marinara sauce at all, but this one was so good. And only 360 calories for a pretty big portion that he couldn't even finish. If Italian food is not your thing, then you should give Longhorn SteakHouse a try. They offer a Flavorful under 500 menu filled with delicious options. Renegade Sirloin, Flo's Fillet, Flat Iron Steak, Sierra Chicken, Napa Grilled Chicken, Redrock Grilled Shrimp, Grilled Fresh Rainbow Trout or Longhorn Salmon. You can't go wrong with either of those choices. So next time your family wants to go out for dinner and you're counting calories, watching your waistline or just want a lighter meal, there's no excuse to stay home. Either Olive Garden or Longhorn SteakHouse are the perfect place to go. Thank you to Darden Restaurants for providing me with a gift card to try out one of the restaurants. All opinions are mine alone. That seafood dish looks SO good! Wish I didn't live so far away from an Olive Garden. Oh the joys of small towns in the middle of nowhere!